This B&H Kit is designed to centralize a vast amount of data by offering you a Synology DiskStation DS1515+ 5-Bay NAS Server with five 8TB hard drives. 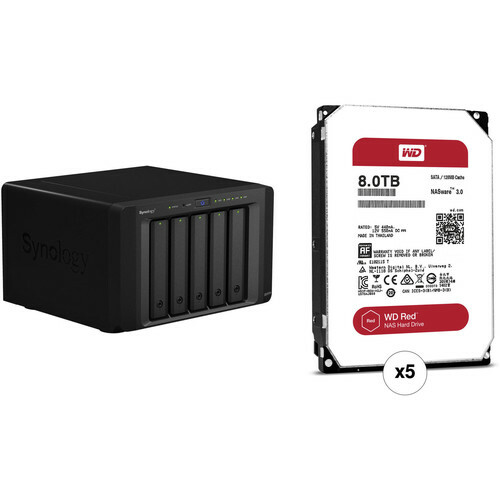 The DiskStation DS1515+ NAS Server and drives are built for speed and reliability, so you can use this kit in home and office environments. This NAS server provides everything from enhanced RAID support to iSCSI LUN Clone/Snapshot support and the ability to administer up to 2,048 user accounts. It sports a 2.4 GHz Intel Atom C2538 Quad-Core processor and 2GB of DDR3 RAM for enhanced system performance. Four redundant Gigabit Ethernet ports are on board to ensure a reliable network connection and distribute your files effectively. Along with redundant LAN support, you also benefit from four USB 3.0 and two eSATA ports, allowing you to connect a variety of peripheral devices such as USB printers, external hard drives, and more. It says maximum capacity is 30TB under specs, how come it comes with 40TB?